1 A None No Power Seat 1 A is a standard Business Class seat however, the proximity to the galley may be bothersome. There is no floor storage for this seat during takeoff and landing. 1 D None No Power Seat 1 D is a standard Business Class seat however, the proximity to the galley may be bothersome. There is no floor storage for this seat during takeoff and landing. 1 H None No Power Seat 1 H is a standard Business Class seat however, the proximity to the galley may be bothersome. There is no floor storage for this seat during takeoff and landing. 1 L None No Power Seat 1 L is a standard Business Class seat however, the proximity to the galley may be bothersome. There is no floor storage for this seat during takeoff and landing. 10 A None No Power Seat 10 A is a recliner-style Premium Economy Class seat. 10 C None No Power Seat 10 C is a recliner-style Premium Economy Class seat. 10 D None No Power Seat 10 D is a recliner-style Premium Economy Class seat. 10 E None No Power Seat 10 E is a recliner-style Premium Economy Class seat. 10 H None No Power Seat 10 H is a recliner-style Premium Economy Class seat. 10 J None No Power Seat 10 J is a recliner-style Premium Economy Class seat. 10 L None No Power Seat 10 L is a recliner-style Premium Economy Class seat. 11 A None No Power Seat 11 A is a recliner-style Premium Economy Class seat. Seat back recline might be limited due to the bulkhead directly behind. 11 C None No Power Seat 11 C is a recliner-style Premium Economy Class seat. Seat back recline might be limited due to the bulkhead directly behind. 11 D None No Power Seat 11 D is a recliner-style Premium Economy Class seat. Seat back recline might be limited due to the bulkhead directly behind. 11 E None No Power Seat 11 E is a recliner-style Premium Economy Class seat. Seat back recline might be limited due to the bulkhead directly behind. 11 H None No Power Seat 11 H is a recliner-style Premium Economy Class seat. Seat back recline might be limited due to the bulkhead directly behind. 11 J None No Power Seat 11 J is a recliner-style Premium Economy Class seat. Seat back recline might be limited due to the bulkhead directly behind. 11 L None No Power Seat 11 L is a recliner-style Premium Economy Class seat. Seat back recline might be limited due to the bulkhead directly behind. 12 A None No Power Seat 12 A is a standard Economy Class seat located at a bulkhead and in the Main Cabin Extra section. The seat features additional legroom and may be selected for an additional fee. The tray table and inflight entertainment monitor are installed in a fixed armrest, therefore, slightly reducing seat width. Floor storage for personal items is not available for use during takeoff and landing. 12 B None No Power Seat 12 B is a standard Economy Class seat located at a bulkhead and in the Main Cabin Extra section. The seat features additional legroom and may be selected for an additional fee. The tray table and inflight entertainment monitor are installed in a fixed armrest, therefore, slightly reducing seat width. Floor storage for personal items is not available for use during takeoff and landing. 12 C None No Power Seat 12 C is a standard Economy Class seat located at a bulkhead and in the Main Cabin Extra section. The seat features additional legroom and may be selected for an additional fee. The tray table and inflight entertainment monitor are installed in a fixed armrest, therefore, slightly reducing seat width. Floor storage for personal items is not available for use during takeoff and landing. 12 D None No Power Seat 12 D is a standard Economy Class seat located at a bulkhead and in the Main Cabin Extra section. The seat features additional legroom and may be selected for an additional fee. The tray table and inflight entertainment monitor are installed in a fixed armrest, therefore, slightly reducing seat width. Floor storage for personal items is not available for use during takeoff and landing. 12 E None No Power Seat 12 E is a standard Economy Class seat located at a bulkhead and in the Main Cabin Extra section. The seat features additional legroom and may be selected for an additional fee. The tray table and inflight entertainment monitor are installed in a fixed armrest, therefore, slightly reducing seat width. Floor storage for personal items is not available for use during takeoff and landing. 12 H None No Power Seat 12 H is a standard Economy Class seat located at a bulkhead and in the Main Cabin Extra section. The seat features additional legroom and may be selected for an additional fee. The tray table and inflight entertainment monitor are installed in a fixed armrest, therefore, slightly reducing seat width. Floor storage for personal items is not available for use during takeoff and landing. 12 J None No Power Seat 12 J is a standard Economy Class seat located at a bulkhead and in the Main Cabin Extra section. The seat features additional legroom and may be selected for an additional fee. The tray table and inflight entertainment monitor are installed in a fixed armrest, therefore, slightly reducing seat width. Floor storage for personal items is not available for use during takeoff and landing. 12 K None No Power Seat 12 K is a standard Economy Class seat located at a bulkhead and in the Main Cabin Extra section. The seat features additional legroom and may be selected for an additional fee. The tray table and inflight entertainment monitor are installed in a fixed armrest, therefore, slightly reducing seat width. Floor storage for personal items is not available for use during takeoff and landing. 12 L None No Power Seat 12 L is a standard Economy Class seat located at a bulkhead and in the Main Cabin Extra section. The seat features additional legroom and may be selected for an additional fee. The tray table and inflight entertainment monitor are installed in a fixed armrest, therefore, slightly reducing seat width. Floor storage for personal items is not available for use during takeoff and landing. 13 A None No Power Seat 13 A is a standard Economy Class seat in the Main Cabin Extra section. The seat features additional legroom and may be selected for an additional fee. 13 B None No Power Seat 13 B is a standard Economy Class seat in the Main Cabin Extra section. The seat features additional legroom and may be selected for an additional fee. 13 C None No Power Seat 13 C is a standard Economy Class seat in the Main Cabin Extra section. The seat features additional legroom and may be selected for an additional fee. 13 D None No Power Seat 13 D is a standard Economy Class seat in the Main Cabin Extra section. The seat features additional legroom and may be selected for an additional fee. 13 E None No Power Seat 13 E is a standard Economy Class seat in the Main Cabin Extra section. The seat features additional legroom and may be selected for an additional fee. 13 H None No Power Seat 13 H is a standard Economy Class seat in the Main Cabin Extra section. The seat features additional legroom and may be selected for an additional fee. 13 J None No Power Seat 13 J is a standard Economy Class seat in the Main Cabin Extra section. The seat features additional legroom and may be selected for an additional fee. 13 K None No Power Seat 13 K is a standard Economy Class seat in the Main Cabin Extra section. The seat features additional legroom and may be selected for an additional fee. 13 L None No Power Seat 13 L is a standard Economy Class seat in the Main Cabin Extra section. The seat features additional legroom and may be selected for an additional fee. 14 A None No Power Seat 14 A is a standard Economy Class seat in the Main Cabin Extra section. The seat features additional legroom and may be selected for an additional fee. 14 B None No Power Seat 14 B is a standard Economy Class seat in the Main Cabin Extra section. The seat features additional legroom and may be selected for an additional fee. 14 C None No Power Seat 14 C is a standard Economy Class seat in the Main Cabin Extra section. The seat features additional legroom and may be selected for an additional fee. 14 D None No Power Seat 14 D is a standard Economy Class seat in the Main Cabin Extra section. The seat features additional legroom and may be selected for an additional fee. 14 E None No Power Seat 14 E is a standard Economy Class seat in the Main Cabin Extra section. The seat features additional legroom and may be selected for an additional fee. 14 H None No Power Seat 14 H is a standard Economy Class seat in the Main Cabin Extra section. The seat features additional legroom and may be selected for an additional fee. 14 J None No Power Seat 14 J is a standard Economy Class seat in the Main Cabin Extra section. The seat features additional legroom and may be selected for an additional fee. 14 K None No Power Seat 14 K is a standard Economy Class seat in the Main Cabin Extra section. The seat features additional legroom and may be selected for an additional fee. 14 L None No Power Seat 14 L is a standard Economy Class seat in the Main Cabin Extra section. The seat features additional legroom and may be selected for an additional fee. 22 A None No Power Seat 22 A is a standard Economy Class seat whose proximity to the lavatories may be bothersome. 22 B None No Power Seat 22 B is a standard Economy Class seat whose proximity to the lavatories may be bothersome. 22 C None No Power Seat 22 C is a standard Economy Class seat whose proximity to the lavatories may be bothersome. 22 D None No Power Seat 22 D is a standard Economy Class seat whose proximity to the lavatories may be bothersome. 22 H None No Power Seat 22 H is a standard Economy Class seat whose proximity to the lavatories may be bothersome. 22 J None No Power Seat 22 J is a standard Economy Class seat whose proximity to the lavatories may be bothersome. 22 K None No Power Seat 22 K is a standard Economy Class seat whose proximity to the lavatories may be bothersome. 22 L None No Power Seat 22 L is a standard Economy Class seat whose proximity to the lavatories may be bothersome. 23 D None No Power Seat 23 D is a standard Economy Class seat that has limited recline and whose proximity to the lavatory may be bothersome. 23 E None No Power Seat 23 E is a standard Economy Class seat that has limited recline and whose proximity to the lavatory may be bothersome. 23 H None No Power Seat 23 H is a standard Economy Class seat that has limited recline and whose proximity to the lavatory may be bothersome. 24 A None No Power Seat 24 A is a standard Economy Class seat located at an Exit Row and is designated a Main Cabin Extra seat. The seat features additional legroom and may be selected for an additional fee. The tray table and inflight entertainment monitor are installed in a fixed armrest, therefore, slightly reducing seat width. Floor storage for personal items is not available for use during takeoff and landing. The proximity to the lavatory area might be bothersome. 24 B None No Power Seat 24 B is a standard Economy Class seat located at an Exit Row and is designated a Main Cabin Extra seat. The seat features additional legroom and may be selected for an additional fee. The tray table and inflight entertainment monitor are installed in a fixed armrest, therefore, slightly reducing seat width. Floor storage for personal items is not available for use during takeoff and landing. The proximity to the lavatory area might be bothersome. 24 C None No Power Seat 24 C is a standard Economy Class seat located at an Exit Row and is designated a Main Cabin Extra seat. The seat features additional legroom and may be selected for an additional fee. The tray table and inflight entertainment monitor are installed in a fixed armrest, therefore, slightly reducing seat width. Floor storage for personal items is not available for use during takeoff and landing. The proximity to the lavatory area might be bothersome. 24 D None No Power Seat 24 D is a standard Economy Class seat located at an Exit Row and is designated a Main Cabin Extra seat. The seat features additional legroom and may be selected for an additional fee. The tray table and inflight entertainment monitor are installed in a fixed armrest, therefore, slightly reducing seat width. Floor storage for personal items is not available for use during takeoff and landing. The proximity to the lavatory area might be bothersome. 24 E None No Power Seat 24 E is a standard Economy Class seat located at an Exit Row and is designated a Main Cabin Extra seat. The seat features additional legroom and may be selected for an additional fee. The tray table and inflight entertainment monitor are installed in a fixed armrest, therefore, slightly reducing seat width. Floor storage for personal items is not available for use during takeoff and landing. The proximity to the lavatory area might be bothersome. 24 H None No Power Seat 24 H is a standard Economy Class seat located at an Exit Row and is designated a Main Cabin Extra seat. The seat features additional legroom and may be selected for an additional fee. The tray table and inflight entertainment monitor are installed in a fixed armrest, therefore, slightly reducing seat width. Floor storage for personal items is not available for use during takeoff and landing. The proximity to the lavatory area might be bothersome. 24 J None No Power Seat 24 J is a standard Economy Class seat located at an Exit Row and is designated a Main Cabin Extra seat. The seat features additional legroom and may be selected for an additional fee. The tray table and inflight entertainment monitor are installed in a fixed armrest, therefore, slightly reducing seat width. Floor storage for personal items is not available for use during takeoff and landing. The proximity to the lavatory area might be bothersome. 24 K None No Power Seat 24 K is a standard Economy Class seat located at an Exit Row and is designated a Main Cabin Extra seat. The seat features additional legroom and may be selected for an additional fee. The tray table and inflight entertainment monitor are installed in a fixed armrest, therefore, slightly reducing seat width. Floor storage for personal items is not available for use during takeoff and landing. The proximity to the lavatory area might be bothersome. 24 L None No Power Seat 24 L is a standard Economy Class seat located at an Exit Row and is designated a Main Cabin Extra seat. The seat features additional legroom and may be selected for an additional fee. The tray table and inflight entertainment monitor are installed in a fixed armrest, therefore, slightly reducing seat width. Floor storage for personal items is not available for use during takeoff and landing. The proximity to the lavatory area might be bothersome. 35 L None No Power Seat 35 L is a standard Economy Class seat that is missing a window. 37 A None No Power Seat 37 A is a standard Economy Class seat in the last row of the aircraft. This seat has limited recline, and the proximity to the lavatory and galley may be bothersome. 37 B None No Power Seat 37 B is a standard Economy Class seat in the last row of the aircraft. This seat has limited recline, and the proximity to the lavatory and galley may be bothersome. 37 C None No Power Seat 37 C is a standard Economy Class seat in the last row of the aircraft. This seat has limited recline, and the proximity to the lavatory and galley may be bothersome. 37 D None No Power Seat 37 D is a standard Economy Class seat whose proximity to the lavatory and galleys may be bothersome. 37 H None No Power Seat 37 H is a standard Economy Class seat whose proximity to the lavatory and galleys may be bothersome. 37 J None No Power Seat 37 J is a standard Economy Class seat in the last row of the aircraft. This seat has limited recline, and the proximity to the lavatory and galley may be bothersome. 37 K None No Power Seat 37 K is a standard Economy Class seat in the last row of the aircraft. This seat has limited recline, and the proximity to the lavatory and galley may be bothersome. 37 L None No Power Seat 37 L is a standard Economy Class seat in the last row of the aircraft. This seat has limited recline, and the proximity to the lavatory and galley may be bothersome. 38 D None No Power Seat 38 D is a standard Economy Class seat whose proximity to the lavatory and galleys may be bothersome. 38 H None No Power Seat 38 H is a standard Economy Class seat whose proximity to the lavatory and galleys may be bothersome. 39 D None No Power Seat 39 D is a standard Economy Class seat in the last row of the aircraft. This seat has limited recline, and the proximity to the lavatory and galley may be bothersome. 39 E None No Power Seat 39 E is a standard Economy Class seat in the last row of the aircraft. This seat has limited recline, and the proximity to the lavatory and galley may be bothersome. 39 H None No Power Seat 39 H is a standard Economy Class seat in the last row of the aircraft. This seat has limited recline, and the proximity to the lavatory and galley may be bothersome. 6 L None No Power Seat 6 L is a standard Business Class seat. 7 D None No Power Seat 7 D is a standard Business Class seat. The proximity to the galley and lavatory area might be bothersome. 7 H None No Power Seat 7 H is a standard Business Class seat. The proximity to the galley and lavatory area might be bothersome. 8 A None No Power Seat 8 A is a standard Business Class seat. The proximity to the galley and lavatory area might be bothersome. 8 L None No Power Seat 8 L is a standard Business Class seat. The proximity to the galley and lavatory area might be bothersome. 9 A None No Power Seat 9 A is a recliner-style Premium Economy Class seat located at a bulkhead. The proximity to the galley and lavatory might be bothersome. Floor storage for personal items is not available for use during takeoff and landing. 9 C None No Power Seat 9 C is a recliner-style Premium Economy Class seat located at a bulkhead. The proximity to the galley and lavatory might be bothersome. Floor storage for personal items is not available for use during takeoff and landing. 9 D None No Power Seat 9 D is a recliner-style Premium Economy Class seat located at a bulkhead. The proximity to the galley and lavatory might be bothersome. Floor storage for personal items is not available for use during takeoff and landing. 9 E None No Power Seat 9 E is a recliner-style Premium Economy Class seat located at a bulkhead. The proximity to the galley and lavatory might be bothersome. Floor storage for personal items is not available for use during takeoff and landing. 9 H None No Power Seat 9 H is a recliner-style Premium Economy Class seat located at a bulkhead. The proximity to the galley and lavatory might be bothersome. Floor storage for personal items is not available for use during takeoff and landing. 9 J None No Power Seat 9 J is a recliner-style Premium Economy Class seat located at a bulkhead. The proximity to the galley and lavatory might be bothersome. Floor storage for personal items is not available for use during takeoff and landing. 9 L None No Power Seat 9 L is a recliner-style Premium Economy Class seat located at a bulkhead. The proximity to the galley and lavatory might be bothersome. Floor storage for personal items is not available for use during takeoff and landing. All Business Class seats feature a 15.4-inch HD-capable touchscreen monitor and every Premium Economy, Main Cabin Extra, and Economy class seatback has an 8.9-inch HD-capable touchscreen monitor with more than 350 audio selections. Personal 110v power ports are offered at all seats for all classes. Food service depends on route, length of flight, and time of day. Flagship Business and Premium Economy passengers are offered premium dining. Main Cabin passengers on long-haul international and certain US transcontinental flights are offered complimentary multi-course meals. Sandwiches, wraps, and snack boxes are available for purchase in the Main Cabin on other flights (US domestic, Canada, Caribbean, and Mexico). This Boeing 787-9 is the newest addition to American Airlines' fleet. This three-class aircraft seats a total of 285 passengers, and features up-to-date amenities, including personal Audio Video On Demand (AVOD) and personal 110v power ports at every seat. Please note that Premium Economy seats might be treated as Main Cabin Extra on certain routes. This seat has a lot of storage space, and it is easy to get out to the aisle. PVG-DFW The seat was a great standard business class seat no, complaints about the seat itself, layout is much better that 787-8. Only complaint is that 5A is missing a window. I love flying and was excited for the two windows every AA business class seat gets, but was very disappointed when I found that 5A only has 1 window. The one window you do get is in the front part of your seat, so every time I wanted to look out the window I had to straighten my seat back and lean forward. Wonderful aircraft and beautiful business class, would probably just get a different business class window seat next time though. As the first row of premium economy this seat enjoys a much wider leg room, also more convenient for the person sitting near the window going to aisle without bothering other passengers. 787-9: this seat has one window however it is a quiet sanctuary, is not impacted by the galley or lavratories, contrary to its yellow icon. This seat offers extreme privacy as there js no one next to you Instead there is a wall. The lavatory is located far behind after entry door. Love it!!!! I submitted a review for Seat 9C earlier and is mentioned below as well. 9A was pretty much the same except we did not get slippers from Shanghai to Dallas. When asked, I was told they're only for business class which is weird since we got it from Dallas to Shanghai. Here's the review I wrote for 9C: Exceeded all my expectations. The seat is wide enough and the leg rest proved to be valuable during the 14hr flight. Food is served to the premium economy section separately so ignore the announcements about what's included in the meal as that's only for regular economy. Food itself was good and presented very nicely on a tray with real silverware instead of plastic and was even cleaned up as soon as I finished. Attendants were definitely more attentive in the prem eco section. The amenity kit was Cole Hann and really nice. Came with slippers as well. There is plenty of leg room in this bulkhead seat. Person sitting at the window could get out without me moving or getting up from my seat. Would travel this again. Exceeded all my expectations. The seat is wide enough and the leg rest proved to be valuable during the 14hr flight. Food is served to the premium economy section separately so ignore the announcements about what's included in the meal as that's only for regular economy. Food itself was good and presented very nicely on a tray with real silverware instead of plastic and was even cleaned up as soon as I finished. Attendants were definitely more attentive in the prem eco section. The amenity kit was Cole Hann and really nice. Came with slippers as well. There is plenty of leg room in this bulkhead seat. Person sitting at the window could get out without me moving or getting up from my seat. Would travel this again. Seat 1L is private and quiet. Yes, it's next to the right side galley entrance, but unless the FAs were serving, it was not noisy or bright as they kept the curtain closed. It felt like being on the plane alone, it was so private. A potential drawback would be being so far from the door, but the FAs do block the Premium/Economy passengers until all Business class pax have exited the plane. Plus, this side of the plane usually gets nice views of Sydney / harbour upon departure is a bonus. The faux leather material on the hard seats made the economy class pretty difficult for a trans-pacific journey. It was very similar to the AA A321 experience. The seatback entertainment was really pretty good (I've flown QANTAS and Air Canada previously on a similar route) but the seat was pretty awful. The CRJ700 I got on to come home had a much more comfortable seat. This was an excellent seat with a LOT of legroom. I'm 6'2" with long legs and I had no problem stretching my legs out. It's a very nice section of the plane with just 3 rows and walls on each side. Very good value. Shanghai-DFW. A flying torture chamber. All econ seats are awful - narrow and hard. Aisles are impassable and, imo, unsafe. Service largely non-existent except for 3 quickies during 13+ hour flight. Tech is good, but config and cranky service spoil it. Avoid at all costs !! This is a main cabin extra seat and it was awesome! I had this seat for the 11 hour flight from Los Angeles to NRT. The bulkhead row 12 seats have way more legroom than the main cabin extra seats in rows 13 and 14. I was able to get up and sit as many times as I needed without interrupting my neighbors and I had 2 windows at my seat. I also had the same power ports that everyone else had. Sure you may not be able to store anything at your feet for takeoff and landing but what difference does that make when you can get up with ease as many times as you want. Only complaint was that the seat was slightly hard and this is the case with all economy seats. For reference, my height is 5'10" and I am submitting the above comments. The overall flight experience was excellent. The only drawback is that the seat was a bit narrow, so I did not have much shoulder room for my 5'9" height. AA Business class has really stepped up to compete with Cathay and JAL. The new 787 is well trimmed, very comfortable and really no downside anymore in comparison. Great business class pods. I truly despise the 787 at 9 across but MCE gives you a little break, at least in leg room. The seats are too close together so the aisles are narrow. At least I shared 13D and E with my wife so it wasn't terrible. Everything else is fine with the entertainment and expected level of service. I will say 12 C and J are the worst seats. The extra room is negated by the narrow and changing aisle. They were hit EVERY time a cart came through. "Main Cabin Extra" seat 12C from NRT to LAX was terrible. Sure, you have a lot of legroom. Not having floor storage is a minor inconvenience. Getting hit in the right arm/shoulder every time a flight attendant walks by is awful. The person sitting in 12D had no such issue. 11J is a typical premium economy seat, however, it does not recline at all. This is the best seat in coach! It's just you and the aisle. This row isn't a bulkhead (9) and doesn't have limited recline (11). And it feels like domestic first class. Loved the flight. Flight 82 from AKL to LAX. 29J has very little room as a standard seat. This was by far the worst flight I have had crossing the Pacific!This is a 15+ hour flight! This particular seat is squeezed in right up against the side of the airplane. The Emergency exit in front of it to protrudes at least 1/2 a foot into the legroom space of this seat. This results in the occupant to sit crooked in the seat with your head firmly pressed on the side of the airplane. This siding conveniently follows the contour of the airplane leaving it very cramped for tall and or large individuals. As far as the noise goes it is transmitted through any part of your body which is in contact with the panelling on the side of the airplane. This would be your head, your arm and leg on the side in contact. This leaves your body is buzzing for the entire flight leaving you very fatigued at the end of the flight. The seat on the other side of this row 24L would be the same. Imagine being at the dentist and having a root canal for 15 hours. Best long haul flite ever. Sydney to LAX in my own private world. Comfortable cubicle with nice storage and good padding on the seat. It would go flat for sleeping but I do not go flat. More upright and very comfortable. Typical AA business class food. Good but not great. Temperature was cool but not cold. Lighting was good for reading. Only complaint was my wife was in 4D and they are not directly across from each other and really had no communication. How AA can expect someone over 6' to sit for 15 hours on an international flight in a 16" wide seat with a 31" pitch is beyond me. Attendant took pity on a few of us and moved us to aisle 24 on the bulkhead with at least some legroom. Overall, a terrible flying experience. Never AA again. 3D wasn't working and my companion's seat, 3H, malfunctioned as well. We were reassigned 1D and 1L prior to takeoff which was fortunate because at least 6 other seats didn't work. The flight attendant said that the seats cost $10K apiece and are a constant headache. Seats 1D and 1H are indeed noisy due to the proximity to the galley and lavatories. I paid extra to upgrade to the exit row because I have two fused ankles and it is very difficult to get them under the seat in front of me. That said, I did get the extra leg room I was after but the shoulder room was horrible. Because there is no window for this row, there is less shoulder space. I spent my entire flight with my arms practically crossed in front of me. Even the arm rest doesn't appear to be in line with the wall of the plane so it's pretty useless. I can't believe I paid extra for this seat. On the other AA plane I flew on (the other leg of the trip) I also had an exit row but middle seat. The difference was that there was no window seat in this case to my left. That was perfect. They crammed this seat into the 787 and it was terrible. I would avoid it unless petite. The seat reclined fully but it was so tiny. I felt so squished and miserable the entire flight. Seat 9H is a mixed bag. The legroom (I'm 6'6") is great for a 13 hour flight. I was able to sleep pretty well on the flight once the cabin settled down. However for part of the flight, the noise from the galley was noticeable. The overhead bin was had plenty of room as it was for row 9 only and made up for the lack of under seat storage. I'd fly this plan and seat again for long haul flights that are 9 plus hours if it's available. AKL-LAX Food was terrible mixed nuts were overheated creating burned mushy nuts. Entrée: Filet& shrimp had condensate juice from shrimp mixing in with filet done well. Ordered cognac after dinner and was told it was not on the planes inventory even though it was on the drink menu. When I complained to the stewardess she said she did me a favor by serving me 2 plastic cups of Champagne! You mean sparkling wine! Business seat came with Casper bed topper not a game changer. 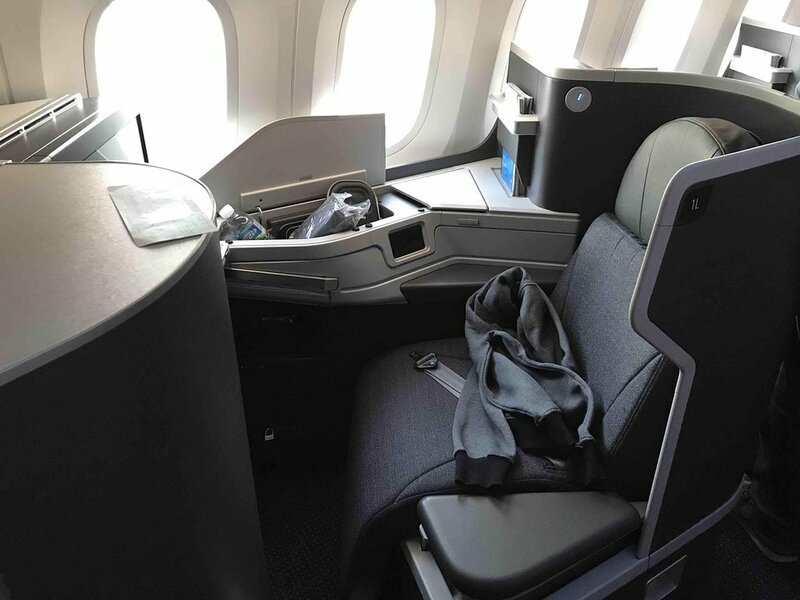 I have seen some negative comments on the new AA787-9 planes, but I dont understand them in Business Class. Seat 8A is located back a little, but I found that it was extremely quiet and undisturbed. AA provides mattresses for the flight, which was the most comfortable bed I have ever had on a plane. I slept for over 7 hours. I would seak this seat out again on any AA flight. The food was OK, but the crew was excellent. My wife and I flew ORD to CDG R/T. Seats comfortable but narrow. Fixed armrest on one side greatly restricts space when in flat mode. Foot well narrows as well. My size 11 feet touched both the bottom and top of the foot well. I cannot believe AA did not install partition between center aisle seats. Be prepared to see and hear everything, including the video screen from your seatmate. FA's never pulled curtain and glaring light from galley the entire flight. Flew AKL-LAX on 12/1/17. Tiny seat with minimal legroom made worse when person in 17A reclined for entire flight. Seat was smaller than on AA's MD-80 domestic fleet. Great entertainment system partly made up for it. Toilets seem bigger than average. We took this 15 hour flight from LAX to SYD. The entire row 24 is awful. The toilets in the nearby lavs flush very loud. Plenty of leg room, but the crew and passengers use the center section as a cut through. We had people stepping on our feet all night long. The two outside sections of row 24 are no better. Passengers stand in front of you while waiting to use the lavs or use it as an excercise area. These seats are only 17 inches wide due to the tray in armrest. Flight attendants struggle to get meal and drink carts down the aisle. Nice plane, bad seating design by American. This exit row seat is a tight squeeze because the door takes your legroom. Im 6-1 230 lb and I usually go out of my way to get these exit row seats, but on this flight I had to switch to non-exit row aisle seat because it was too tight. Due to my AA status, we were upgraded from regular coach to Main Cabin Extra for free. Although that meant a few inches more pitch, the seats are very narrow. Our seats were in the bulkhead at row 12. 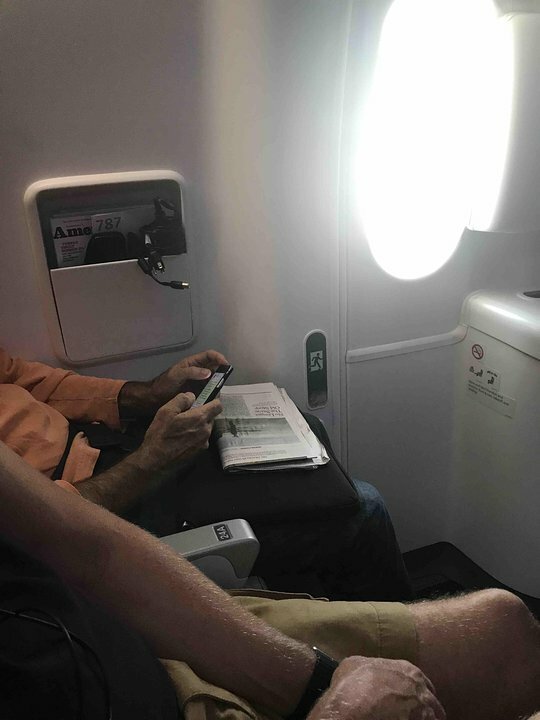 Because the tray table is in the arms, the seats are even more narrow. And the tray tables are really tiny. The service was OK but pretty rushed. Don't recommend these seats unless you weigh less that 110 lbs. I flew both ways between LAX and AKL. I generally agree with existing comments. The galley noise didnt bother me much, but i kept headphones or earbuds on almost the entire flight even when i wasnt listening to anything. I could definitely understand some people being bothered by the noise when the galley got busy. Otherwise the seat was great. My only gripe is that AA locks the windows on their 787s in the opaque setting during the flight. This makes the seat more of a wall seat instead of a window seat. Particularly for night flights, I dont understand the point of this. I flew in 2a on the new 787-9 from Auckland to lax. New plane and crew werent sure where to find things. Seat 2a is a problem, you have a harsh florescent light in your eyes the whole flight. Crew is unable to dim it since it is right outside the cockpit. First couple of rows are pretty noisy with the galley too. I would opt for a seat in mid to rear of the business class cabin. Seat 24L is decpetive. It looks like a great exit row seat until you sit down. The sidewall does not indent so there is no shoulder room. The exit door then extends out of the sidewall and into your leg/knee space. The only way my 6'1" frame can comfortably sit in this seat is to lean comepletely forward, which is not very comfortable either. I was excited to be in a 787 for the first time and then was immediately let down by it due to its narrow and hard seat, way shorter leg room and no way to stretch even a slight bit while seated in the seat. When AA280/281 flew 777 it was way better, at least for the economy seats. Lots of noise from the crew in the galley for the entire flt from Paris to DFW.i think they were taking inventory or something. Also, you have to squeeze by the attendants each time that you go to the bathroom. The seat was not comfortable. It had a headrest with a split between it and the seat, so when you lay flat you have a little gap to fill. The arm rest was broken and banged every time I moved. This was a newer aircraft with the herringbone layout. The "clanging" from the FA's in the galley was over the top, so choose a seat away from the galley. American did not score any points with this trip-very disappointed at this price point. Limited oberhead bin storage due to 1H not having any overhead bin storage and mist share. Also exremely noisy from attendants chatting in forward galley. Seoul to Dallas 23 May 17. Noticed the extra leg room as part of main cabin extra feature. Was able to put bag under seat in front and stretch out legs on top of bag for foot rest. But the most narrowest seats i've ever experienced and with minimal seat back decline. FA service was average. There was no water offered between the two meals and snack unless i happened to sleep through it, so i was lucky to bring a bottle of water with me. Great seat. I really like this small "Premium Economy" cabin. Seats are comfortable, footrest is nice touch. Cabin is quiet. Entertainment is very good although it is a small screen that pulls up from the armrest. Restroom in front of this row is also shared by Business and is the larger restroom. Meals are served on real dishes with real silverware! However, I always order gluten free and mine was served in the plastic containers and flimsy plastic flatware the same as regular coach. I wrote to AA about this. Windows that dim or blackout by remote are a nice touch. No more flimsy plastic pulldown shades. I agree with another comment about the cabin atmosphere not seeming so dry on this plane. I would definitely fly in this cabin again. I really like this seat. It did not bother me being close to the galley. The restroom behind me on this side of the plane is the larger one. Very nice. Lighting is updated and very good. Entertainment--movies were great. Bed was a little hard but it does lie flat which is good. It would be nice if they provided a pad for the bed as was provided on the 77W. Food was good. However, the "champagne" served was not the real kind that was listed on the menu. It was domestic and thus not really champagne. Overall good experience in business class. My husband was next to me and seats are situated so that we could talk and see each other. New lie-flat BIZ seat. I LOVED IT! It was "snug" for your feet, but shoulders and hips were quite comfy and MUCH more comfortable than current wide-body angled lie-flat seats. Space was great and working areas adequate. Flew business class DFW-MAD in feb 17. Plane is really nice .very spacious and you can fell the improvement in cabin pressurization after a 9 hour flight. New buainess class seat is okay. Very comfortable for seating but the lie flat is fairly hard and tight if you are over 6 ft . Lots of video entertainment choices but the wired remote still screams 1998. Service was exceptional going over, on par with foreign airlines i have flown. Coming back it was stereotypical - tenured flight attendanta who acted annoyed you were there. 19Feb17, 24B: Pro: Plenty of leg room as this is an exit row. Cons: The seat feels much narrower than the 777 or even 763. The IFE is stored next to the seat, which was slightly problematic, but the tray table was of greater concern. It leaned to one side, so I had to hold my meals to prevent wearing them. I would not book 24A because the aircraft door juts in a little and limits space. Typical AA food and drink service and the FA's were friendly. One of them told me she didn't like the 789 because there was little food prep space in the galleys. First time trying american premium economy cabin and absolutely loved it. Bulkhead seats have full foot rest.very specious and nice seat. Has a little storage area under the armrest. I always choose American Airlines im my trips to US. My records show more than 1 million miles in AA This new 787 is one of the worst planes i have travelled. The seats are narrow and closer to the front chair. Finally a comment: The plane is new but the passenger is not American firt choice. 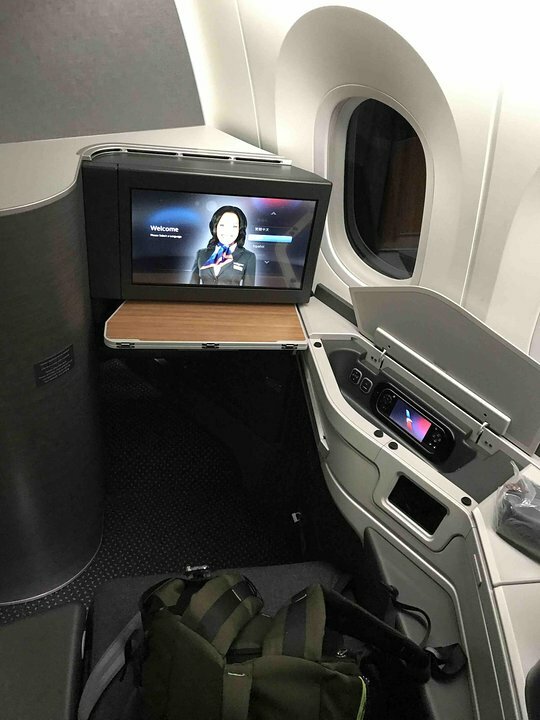 I had the opportunity to fly on AA 963 on November 14 from DFW to GRU (Guarulhos - Sao Paulo, Brazil), the equipment was a Boeing 787-900 with AA's new International Premium Economy class. The aircraft went into service on this route on November 3, so it had been operating less than two weeks on this route. Upon boarding, a shrink-wrapped plastic bundle was waiting on each Premium Economy seat; it contained a fleecy blanket, pillow with patterned paper pillowcase, over-the-ear headphones, and an amenity kit consisting of a felt envelope containing an eye mask, ear plugs, disposable socks, and compact toothbrush/toothpaste. If you unwrap all of it, there isn't really anyplace to put it other than shoved next to you in the seat or under you in the seat. Mine was the first flight for many of AA's flight attendants on this plane. They were unfamiliar with the class of service and AA's intentions for the cabin. They were also unfamiliar with how to deploy bulkhead-row infotainment screens and how the seats controls are meant to work. Probably because of the flight attendants' unfamiliarity with the plane, cadence of service was off. The flight attendants were hand- carrying a lot of items from the rear galley to the forward galley which is immediately ahead of the Premium Economy cabin (between Premium Economy and Business Class). I overheard discussion that some food/beverage wasn't catered to the correct galley. After what seemed like an eternity, we got snack/drink service, though the snack was delivered and drink order taken, but it took about 10 min for my gin and tonic to arrive (and it arrived without the gin). Immediately thereafter dinner arrived- no time to enjoy my cocktail before dinner. When dinner was served, it came with a wine glass on the tray, but no offer of wine was made (and indeed, the wine I did finally get was poured into a plastic cup instead of being poured into the wine glass on my tray). The dinner was all on porcelain dinnerware, except for the hot entree which was served in a plastic disposable tray. The meal itself was OK- at least the food on the real plates. There was a prawn cocktail, green salad, and lemon cake for dessert. The main had the typical "Chicken or Pasta?" options; the chicken in the disposable I chose tray was typical back-of-the-plane fare. Cadence of service was off at breakfast service (60 min before arrival) too- the food preceded the drinks cart by 15 min. Breakfast consisted of fresh fruit, a warm cinnamon bun, and some yogurt. I'll give a dishonorable mention to the coffee served with breakfast- it was truly terrible, to the point of being undrinkable brown fluid. It tasted like the inside of the plastic pitcher from which it had been poured. 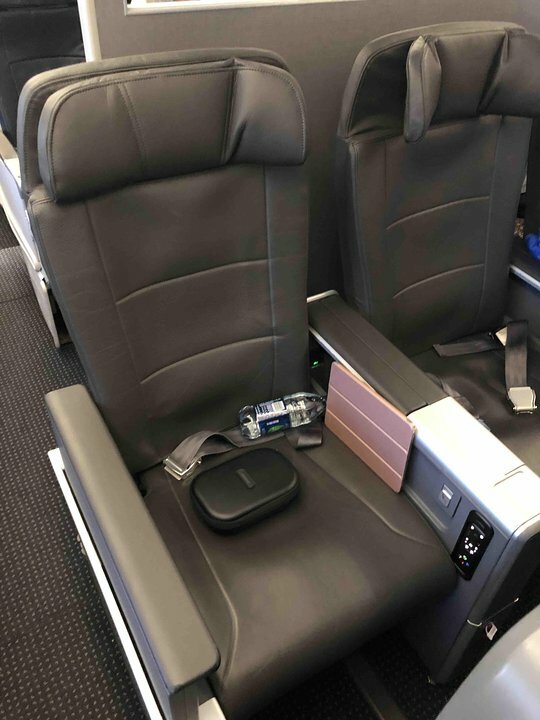 Some comments on the cabin itself - it's just 3 rows of 2-3-2 configuration (rows 9-11); each seat has its own video screen (larger than economy), its own armrests (one of which contains a tray table, the other has storage and a mains outlet for charging devices). At the bulkhead, the leg/footrests were great and legroom was good, though the leg rest is too short to support my long legs properly. The seat width was appreciated, and very noticeable when walking back through the economy cabin to use the lavatory. The seat's headrest is adjustable, and it has flaps on each side to support the head for napping, though the 15% max seat recline isn't enough to really get comfortable. There is a lav-occupied indicator on the bulkhead at front of cabin, for the two lavatories immediately ahead of the cabin. But the Flight Attendants repeatedly told us that those lavatories were only for business class passengers only - so why is there a signal about their availability in our cabin? Our cabin is to be using the lavatories in Economy, behind row 23. There is a curtain at the row 9 bulkhead to separate business class (and its galley/lavatories) from premium economy. But the FAs constantly came thru the curtain; the curtain was always brushing my legs in seat 9H throughout the 9h30m flight. it was incredibly irritating- why bother closing the curtain if they're constantly going to be ducking under it? While on the flight I watched the movie "A Bigger Splash" - it was utterly bizarre, both boring and irritating, but it had the line "Premium economy- sounds like a pen for dirty animals". Made me chuckle. Inflight entertainment options were actually pretty good on AA's system; in addition to that move I was able to watch Absolutely Fabulous the Movie; Bad Moms, Crazy Stupid Love, and Spy with Melissa McCarthy. My trip home on AA 962 on November 18 came at the end of a very long day. I worked all day, leaving the office in Sao Caetano at 5:30 PM; the taxi ride to the airport took 90 minutes. The 10:55 PM departure meant several hours to spend in the Admirals Club, which was fine. Boarding was a bit confused due to "Priority AAcess" never being called, but there was still room for my rolling bag and backpack overhead from my bulkhead Seat 9L. Upon sitting down, I was handed a Premium Economy dinner menu- that had been missing on the flight down. The dinner entree choices were Salmon or pasta. On a plane out of São Paulo? Damn straight I chose pasta. Once underway, there was no cocktail service; the drink offered was what I wanted to drink with dinner. Once again I got wine in a plastic cup, then was handed a dinner tray with a wineglass on it. Even the pasta entree came on a real plate this time... and it looked pretty and tasted amazing. Really. Also on the meal tray were a very nice meat/cheese plate, and green salad, a roll with butter, and a cake. Breakfast was served about an hour before arrival; it was yogurt, a warm roll, and what was probably the freshest, tastiest fruit I've ever had on an airplane. I skipped the coffee this time around. Overall AA's Premium Economy class is an upgrade from Economy (and even Main Cabin Extra), and is better than the EVA and BA Premium Economy cabins I've flown in the past 18 months (largely because the plane is newer, so has chargers and large in-flight entertainment display screens). While nowhere near business class levels of comfort, the Premium Economy cabin makes the long-haul flight more bearable! Seat 10D is in the new Premium Economy class. Those seats are nice, but the legroom is no better than that of Main Cabin Extra. The foot-rests of seats on rows 10 and 11 are a joke. Ridiculous. They are just a small support for the feet (I am 6'2"and if I used them my feet would just be pushed up) whereas row 9 has a real foot/leg rest that unfolds forward from underneath the seat . The trays ara all in the armrests, which are bulky and do not retract up. So if you are next to an empty seat, you will not be able to stretch to the side (you would be better off in Main Cabin Extra without anyone sitting next to you). The economy seats on this plane are very narrow (both economy and main cabin extra). Premium Economy seats are wider. But seatbacks do not recline much more than those of economy or main cabin extra. Besides not having the tray on the back of the seat in front, the storage compartment (with magazines, barf bags etc) is rigid. You cannot put even a small bottle of water there. Food is OK. The lighting scheme inside the 787 is interesting, but American does not darken the cabin enough. You need eye shades if you like a dark environment to sleep. I did not feel the "moister" cabin atmosphere that has been advertised for this plane. Flew LAX-DFW. This seat offers outstanding leg room and knee room. I'm 6'6" and could not reach the bulkhead with my fully outstretched legs. As an exit row seat, it is slightly narrower than your typical coach seat, but not irritatingly or painfully so (AA's new A321 exit rows are the industry leader in excruciating narrowness, in my opinion). The flight attendant does sit directly in front of you for takeoff and landing, but there is so much room that it still doesn't feel cramped. Only real drawback is that the window is slightly misaligned due to the exit door, so don't expect to get great views out of those large and lovely 787 windows. Row 18 is directly over the wings. Windows are offset. The seats are a little too firm for my taste, and the legroom is pretty tight. DON'T drop anything or you'll have a really hard time retrieving it. 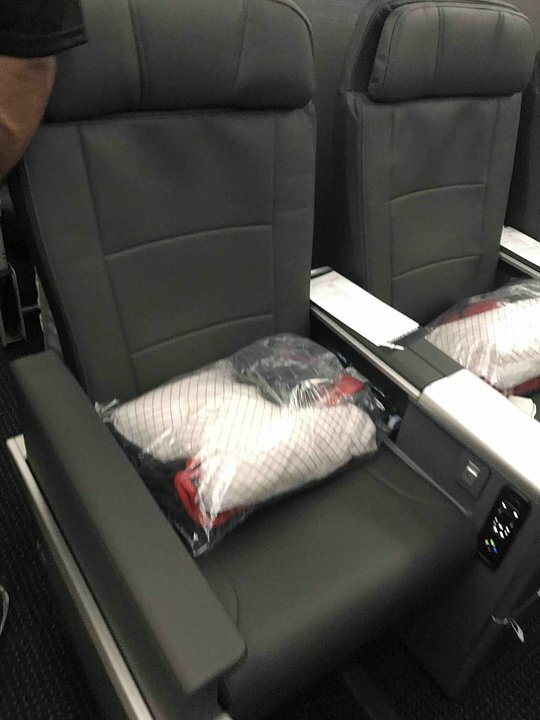 Flew LAX to DFW and they finally got the bizz class seats right, after the junk in the 787-8. All forward facing, no control console blocking the fantastic windows, and just incredibly better. Too bad they most likely will not update the 788s. Also I sat for a bit in MCE in second row. 2-3-2 wide seats are great and I would have stayed there happily had they not moved me up front. Too bad we'll never see a 789 on my normal SAntiago to LAX route. I flew on a one-week-old 787 from LAX to DFW. The pilot said these were shakedown flights before the aircraft began flying routes from the U.S. to the far east. Like others, I found the seat to be quite narrow and the fuselage of the aircraft encroached into my seat's headspace. Unlike others here, I found the aisle was no narrower than main cabin aisles in other aircraft and the seat cushion did not tilt up enough to notice, even though I was paying attention to it. I liked the electronic window shades because they allow you to cut down on extreme sunlight while still being able to see outside. The seat-back IFE worked perfectly. The extra leg room of MCE was great. the lack of IFE boxes under the seats was a welcome surprise because I always have a bag to put under the seat in front of me. I really liked having individual air vent and light controls at my seat, something I miss on some 777s. Unfortunately, when we landed at DFW the ground crew had trouble aligning the jet bridge with the new aircraft, which caused a delay and embarrassment for AA, considering DFW is their home airport. The single seats along the windows offer a very private flying experience. The seat electronics are overly complicated, with a small tablet-like touch screen for selecting from a vast array of seat positions. At one point my seat control simply became unresponsive and the flight attendant had to "reboot my seat". Who'd ever thought that sentence would exist? The new lay flat business seats are very private with the window seats angled towards the windows and the centers angled towards each other you have a very secluded feel. The seats are a very good quality and a pleasant dark brown fabric which makes for a comfortable seat. Going fully flat into the bed is easy but it does resemble a coffin somewhat with very narrow foot space and a wider bowl up towards the head and shoulders. American gives the width as 21-26 inches and I found that unless I scooted all the way up towards the top of the head portion my shoulders touched both sides when lying on my back. I am not a big guy - 5'9" and 190 pounds so taller, broader people may need to put the aisle arm rest down so they are not bumping their shoulders. At least that is a good option. Row 5 does only have one window as opposed to two and so does the back row , row 8. The windows are huge and the electronic dimming is amazing - you can set it to a deep blue while cruising. A very quiet aircraft and noticeable better on your airways and nasal passages without drying you out. The new Premium Economy cabin is a very small cabin with only three rows of seats with a bulk head of sorts behind separating from Main Cabin Extra. The seat width is a big improvement from the typical coach seats American offers and the additional legroom is more or less on par with what you find in domestic first class at 38 inch pitch. With a two, three, two layout the middle seat in the center is tough and needs a person on the aisle to get up and move out to let someone out. The seats have wider arm rests as well so you are not competing for the arm rest with the person next to you. Good amount of recline and having a foot rest does make this a very comfortable alternative to standard coach or even MCE. The window two seats are the best bet. Only 1 window at 5A and 5H. Structural item occupies where other window should be. Wish someone wrote this seat review before me so I could have picked another seat. I fly to look out windows. American Airlines flies 1 versions of Boeing 787-9.